M&T Trucking, Inc. has been recognized in the Rochester Democrat & Chronicle as one of Rochester's Top 100 Companies each year from 2001 through 2007. The Rochester Top 100 Program, co-sponsored by KPMG LLP and the Greater Rochester Metro Chamber of Commerce, honors the area's most dynamic and high-performing privately-owned businesses and their contributions to the growth and success of the entire community. The award recognizes both large and small privately-owned companies which have, and will continue to have, a positive influence on the future of Greater Rochester. M&T Trucking of Pavilion is being recognized as "Outstanding Retail/Service Business" of the year, 2005. Each year the Wyoming County Chamber of Commerce recognizes businesses that have made major contributions to the economic vitality and quality of life of Wyoming County. The Chamber's criteria for selecting winners is based on actions such as an expansion project, capital investments, job growth, community involvement or for their contributions that strengthen their industry sector. "We almost lost [M&T Trucking] to Monroe County" stated Chamber Executive Director Jim Pierce. Two years ago, the company considered moving it's business and 50 jobs to Monroe County because new growth opportunities had pushed them to the point where they needed to consider an expansion to their existing facility or relocate their business. The Wyoming County Chamber partnered with the Wyoming County Industrial Development Agency to assemble a very competitive economic development incentive package that was one of the main reasons the company decided to stay and expand in Wyoming County. M&T Trucking recently completed a 12,000 sq. ft. building and is proposing to increase their employment numbers to 100 over the next three years. This family owned business in Covington, which opened its doors in 1986 with only one truck has rapidly grown. The company's main source of business comes from hauling refuse and farm commodity products. "Wyoming County is extremely fortunate to have retained this business," stated Jim Pierce. 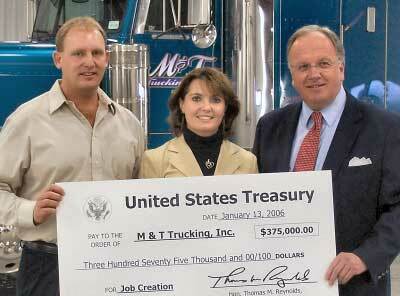 Congressman Tom Reynolds recently presented an award to M&T Trucking for small business job creation in 2006. Start With Trust -- Establish and maintain a positive track record in the marketplace. Advertise Honestly -- Adhere to established standards of advertising and selling. Tell the Truth -- Reveal all related conditions or exceptions regarding products or services offered. Be Transparent -- Openly identify the nature, location, and ownership of the business, and clearly disclose all policies, guarantees and procedures that bear on a customer.s decision to buy. Honor Promises -- Abide by all written and verbal agreements. Be Responsive -- Address marketplace disputes quickly, respectfully, and reasonably. Embody Integrity -- Approach all business dealings, marketplace transactions and commitments with integrity. M&T Trucking was recently selected to be featured in First Class magazine, in the December issue. M&T Trucking is proud to support the ARC Foundation. We have made a dream come true for "Leo's Dream" to ride in a big truck. M&T Trucking sponsors and supports Junior Achievement. For more information about JA, visit www.JA.org.